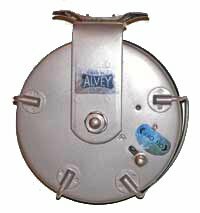 Alvey is well known Australian manufacturers of an excellent range of side cast surf fishing reels. However, they also produce boat reels and a very good saltwater fly reel. Alvey’s fly reel – there is one model which comes with either a yellow or black fibreglass spool – has found particular favour with members of the Canterbury Sports Fishing club who put Alvey’s saltwater fly reel creation to good use off the Kaikoura coast. Several members of the club have achieved New Zealand records whilst fishing for blue and mako sharks together with albacore tuna. When fishing the saltwater fly for these powerful oceanic species you need a reel that is tough, corrosion resistant, and above all has a smooth drag system that won’t let you down when these fish make long powerful runs. The Alvey general purpose saltwater fly reel has a super strong 95mm (4″) diameter spool, fitted with a Teflon and brass multi-plate clutch and a non-reverse drag which can be disengaged with the flick of a button. All metal parts are either brass or stainless steel making maintenance minimal. The all up weight of the reel without a line is 415g. This is slightly heavy for a saltwater fly reel but balances well with a saltwater fly rod. Capacity 300m-9kg Dacron and fly line. 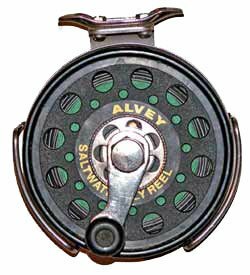 Alvey’s saltwater fly reel is also popular with salmon anglers. Its robust construction and powerful drag system make it particularly suited to fishing for salmon when used with an ultra fast sinking fly line. A big thirty pound plus salmon in fast water can take some stopping on a fly rod! 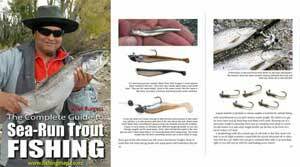 This reel also works well when used to fish for quinnat salmon and big sea-run brown trout teamed with the Canterbury Lure Rod. Perhaps the best feature of all is the price, At around NZ$200 retail this is far and away the best value for money saltwater fly reel on the market especially when you consider that it will do the job extra well and, thanks to its robust design it will last a lifetime.